There are many things in life not good for you. Refined sugar happens to be one of them. Although I am on a quest to change lives by inspiring healthy choices, I too occasionally choose a glass of wine or a cookie. When I do eliminate sugar from my diet completely—I am more clear-minded, energetic and inevitably, I drop a few pounds. As a wellness leader, I was determined to find out why and figure out the impact this sweet, powdery substance makes on us daily. Let’s start with the basics: what is sugar and why can it be bad for you? There are different kinds of sugars, which include glucose, fructose and sucrose—all carbohydrates, known as simple sugars. Each kind has the same amount of energy per gram, however, the greatest differentiator, is how the sugars are processed by your body. Glucose circulates in the blood stream and is your body’s preferred source of energy. Most high glycemic carbohydrates that you eat are turned into glucose for immediate energy use or storage. Unlike fructose, insulin is secreted primarily in response to elevated blood concentrations of glucose. Insulin rapidly converts excess sugar to fat. Fructose is naturally found in fruits and vegetables and is only metabolized in the liver, which can be fat-producing in larger quantities, however, it does not trigger insulin to be released into you system and therefore doesn’t enter your cells as energy in the way the glucose does. 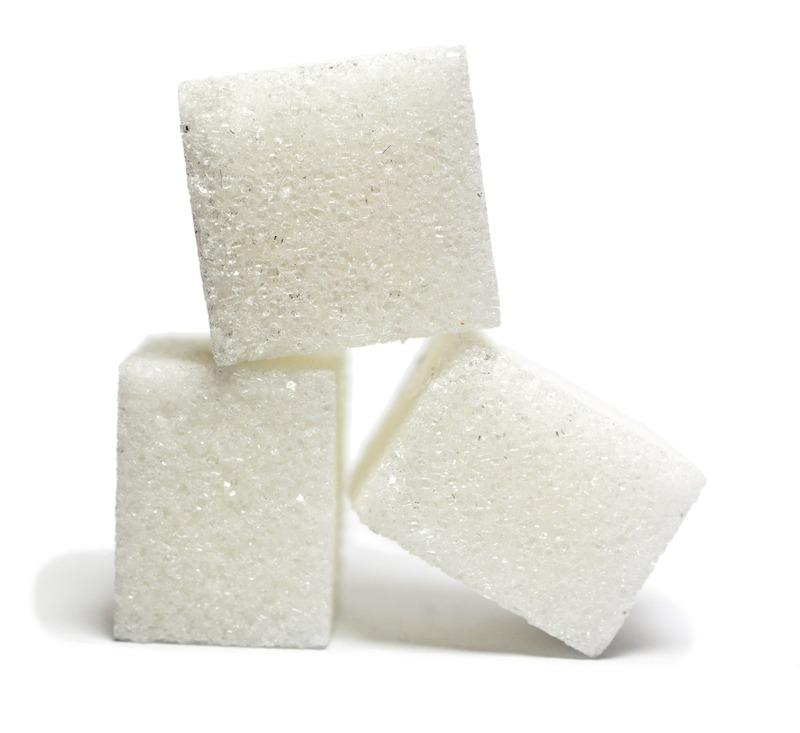 Sucrose, most commonly known as table sugar, is taken into the body and separated upon digestion into glucose and fructose. The glucose is adsorbed as energy as usual, however, the fructose that is adsorbed at the same time is synthesized into fat. Refined sugar is a highly inflammatory substance. It’s also the favorite food of fungus in the body, disrupting the healthy diversity of the microbiome, and potentially being the driver of chronic fungal infections. Added sugars (like sucrose and high fructose corn syrup) contain high calories with no essential nutrients; this is why they are called “empty” calories. There are no proteins, essential fats, vitamins or minerals in sugar—just pure energy. When people eat upward to 17-21% of calories as sugar (or more), this could become a major problem and contribute to nutrient deficiencies or heart disease rather than those who limited their calories from sugar to 8% of their total caloric intake. As I explained above, fructose is only processed in your liver. This highly engineered sugar is essentially turbocharged fructose. This sweetener is several times sweeter than standard table sugar, thus raising our threshold for sweetness. This leads us to crave sweeter and sweeter foods, diminishing our pleasure of naturally sweet whole foods. It’s turned into glycogen and stored in the liver until we need it but since the liver is already a high source of glycogen, any additions typically overload the liver and turns it into fat. Eating large amounts of sugar can lead to fatty liver and a myriad of associated health conditions. This does not apply to whole fruit as it is difficult to have complications in connection with fructose from fruit in it’s natural forms. Insulin is an essential hormone in the body. It facilitates glucose (blood sugar) to enter cells from the bloodstream and tells the cells to start burning glucose instead of fat. Having too much glucose in the bloodstream is harmful because it makes it difficult for your body to process it properly—metabolic dysfunction. For example, the extra insulin in your bloodstream can affect your arteries as part of your body’s circulatory system. It causes their walls to grow faster than normal and get tense, which adds stress to your heart and damages it over time. This can lead to heart disease, heart attacks, and strokes. Eventually, as insulin resistance becomes progressively worse, your pancreas won’t be able to keep up with the demand of producing enough insulin to keep your blood sugar levels down, leading to burnout of the insulin producing cells of the pancreas. At this point, blood sugar levels skyrocket and a diagnosis of type II diabetes is made. Given that sugar can cause insulin resistance, it is not surprising to see that people who drink sugar-sweetened beverages have up to an 26% higher risk of Type II diabetes. Cancer is one of the leading causes of death worldwide and is characterized by uncontrolled growth and a multiplication of cells. Insulin is one of the key hormones in regulating this sort of growth. For this reason, many scientists believe that having constantly elevated insulin levels can contribute to cancer. In addition, the metabolic problems associated with sugar consumption are known as drivers for inflammation, another effect of cancer. There are multiple studies that show that people who eat a lot of sugar are at a much higher risk of getting cancer. I mentioned my occasional indulgence in a glass of wine or a cookie—I know first-hand it can sometimes call to you, and is addictive to many people. Here’s why. Sugar causes a release of dopamine in the reward center of the brain, more than those found from natural foods. People tend to want to indulge to continuously replace the pleasurable “high” that the dopamine release produces. According to Candice Pert in Molecules of Emotion: The Science Behind Mind-Body Medicine, sugar stimulates the opiate receptors in the brain much in the way that cocaine and opium do, and should be classified as a class one drug. The way sugar affects hormones and the brain is a recipe for fat-gain disaster. It leads to decreased satiety so that one slowly ceases being satisfied by the foods they are eating. These empty calories do not properly feed the body or the brain, nor provide an energy source the way that glucose does. Not surprisingly, people who consume the most sugar are by far the most likely to become overweight or obese. This applies to all age groups. Many studies have examined the link between sugar consumption and obesity and found a strong statistical association. I feel like it’s my duty to help shine the light on this addictive source of disease so that we can continue to discover ways to reduce or eliminate it from our diets, our lives. Amy Holmwood is a health and wellness advocate, in addition to being a proud wife and mother. Amy has spent more than 25 years in the insurance industry. After retiring, Amy has become a digital marketer of science-based, natural nutrigenomic gene activators, http://www.amyholmwood.com.